After suspending online sales in Russia last week due to an extremely volatile ruble, Apple on Monday reinstated the Online Apple Store with price increases of up to 35 percent for certain products like the iPhone. It took Apple nearly one week to bring its digital storefront back online as the company waited for the ruble to stabilize from its dive against the U.S. dollar. Russian buyers saw inflated pricing when the Online Apple Store resumed operations earlier today, with a 16GB iPhone 6 going for 53,990 rubles (about $956), up 35 percent from 39,990 rubles last week, Reuters reports. 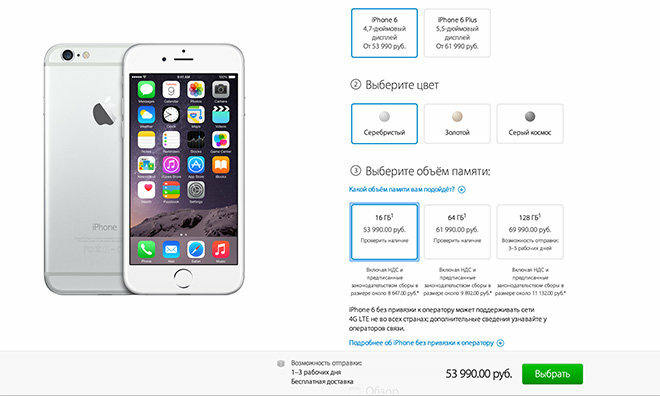 This marks the second time in less than one month that Apple changed product prices due to ruble fluctuations. Last week, Russia's central bank raised interest rates by 6.5 points overnight, causing a massive 19 percent decline the next day. The ruble's value deterioration over 2014 has seen the dollar prices soar more than 70 percent. In January, one dollar equaled 32.9 rubles, but the current exchange rate has a dollar worth about 54 rubles. Russia's economy is feeling the hurt from ongoing trade sanctions and dropping oil prices. Former finance minister Alexei Kudrin told the BBC on Monday that Russia is entering, or has entered, a "full-blown economic crisis" and expects the situation to worsen come 2015. While oil is one of Russia's main exports, Kudrin calculates the price drop accounts for about one quarter of the ruble's decline. Western economic sanctions, along with worries of even stricter sanctions over actions in Ukraine, account for a more significant 40 percent, Kudrin said. Apple's Online Apple Store opened in Russia last June and still serves as the company's only direct sales method as no brick-and-mortar locations have been built in the country. Rumors from 2011 claimed Apple would soon move on a property in Moscow, but that project has failed to materialize.